This post was going to be titled: “Surrounded by Craft Supplies and Out of Ideas” which is the state I’ve been in for the past week or so. But then, as is often the case, just as I sat down to admit defeat, I had in inconveniently timed, sort of iffy, idea! Welcome to Crafting in a Hurry with Cheltenham Road. It came together quickly and you can learn from my it-shouldn’t-come-together-that-quickly mistakes! 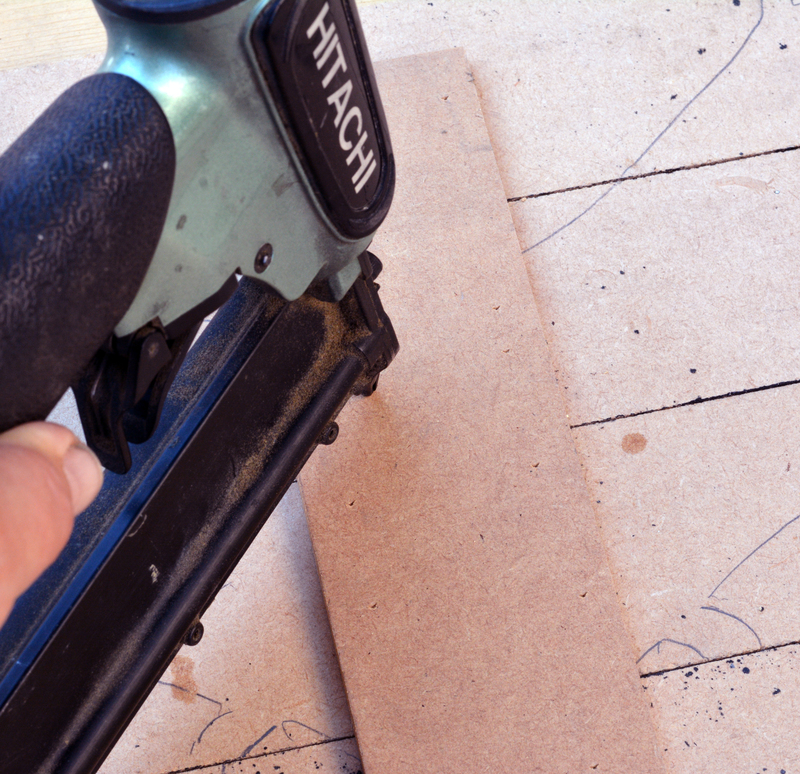 I started off with four pieces of leftov …Reclaimed MDF. 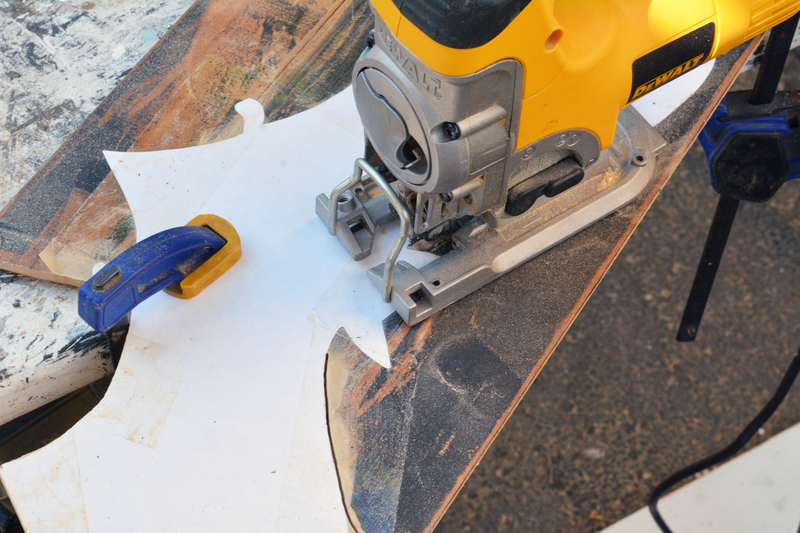 MDF is great – easy to work with and inexpensive but it’s doesn’t have any texture so I needed to add a bit for interest. Where the paint didn’t stick the MDF was revealed but it looked a bit to “fresh” for me so I touched it up with just a light wash of wood stain which also dulled the paint a bit more. Once everything had dried a bit I flipped the pieces over and connected them using glue, my pin nailer and some more reclaimed (!) MDF. 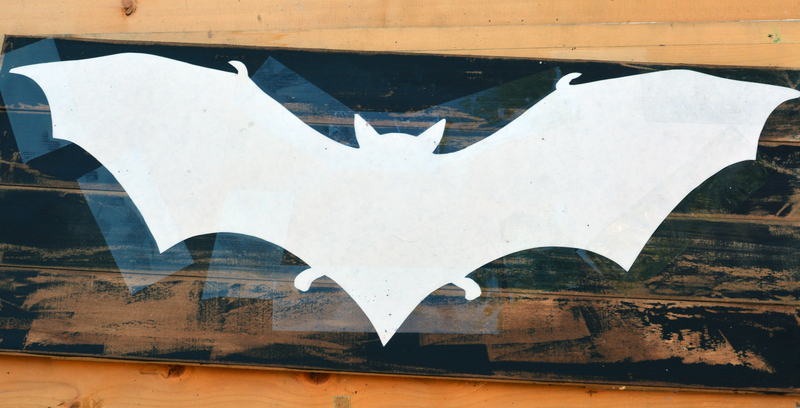 I printed out the silhouette of a bat that I got from The Graphics Fairy. 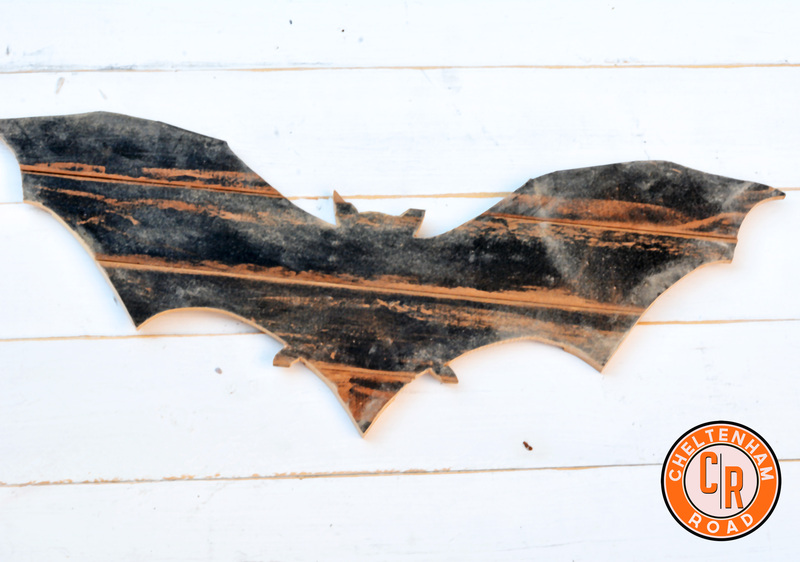 My bat was to be 23″ wide so I just printed it out on two pieces of legal sized paper and taped them together and then taped the whole thing to the MDF boards. But wait! Why stop there David?! You’re in a hurry, so why not do something else that may or may not work?!!!! I know! Who could have seen this coming?! But, nonetheless it came and must be attempted! I kinda knew it wouldn’t. What’s really needed are white letters and white isn’t an option with this technique. So I tried orange and you could see them but not too well. I went back in with some orange paint and followed the basic shape of the letters which looks …..rustic…….. Despite some “oops” along the way I really like this and think its a fun prototype! It could be cool wall decor or something interesting to hang on the front door. It was easy to make (esp if you don’t try doing it in a 2 hour period) and making them in a bunch of different colors and textures would be quite do-able. Stay tuned! I may make more! It came out fine and the slats on the back held the shape together while cutting but I lost a couple of details on the bat. If I did it again I would cut a silhouette backer out of MDF and then attach the slats to the backer. Color. If I was going to leave it just plain then the black totally works. However, I do like the text. Next time I would maybe distress the wood with a black undertone and a white top coat. That way you’d end up with a sort of grey and black bat which would be sufficiently spooky and allow the text to pop. David, you crack me up! I ALWAYS look forward to your antics! 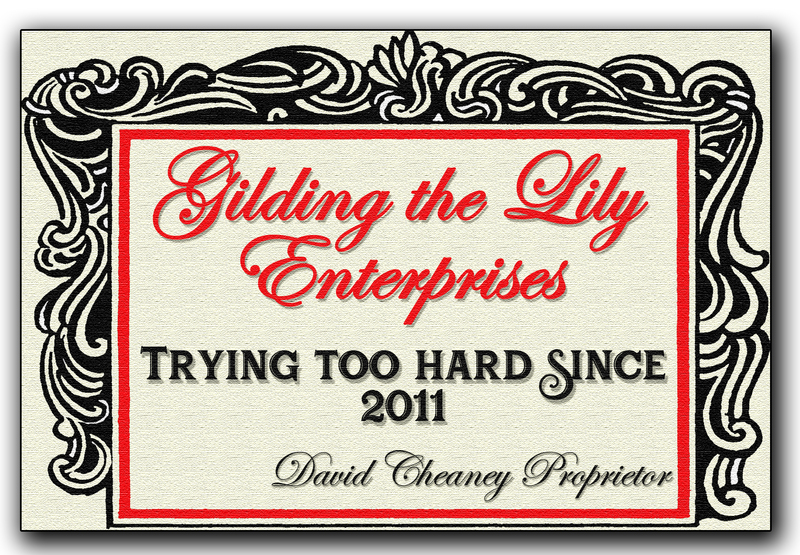 ps- you do know it’s GILDING the Lilly and you have a typo–ooops! Thanks! and thanks for the proof read! Whoa! Holy Mackerel, Batman! I go on vacation, and you changed your blog. Okay, there was spacing when I sent that. You get the idea. Thanks! I laid it out that way at first but, though it looks fine when typed with spaces, it looked confusing when actually separated by bat-body. I think, next time, I may use different, less sentency, text! 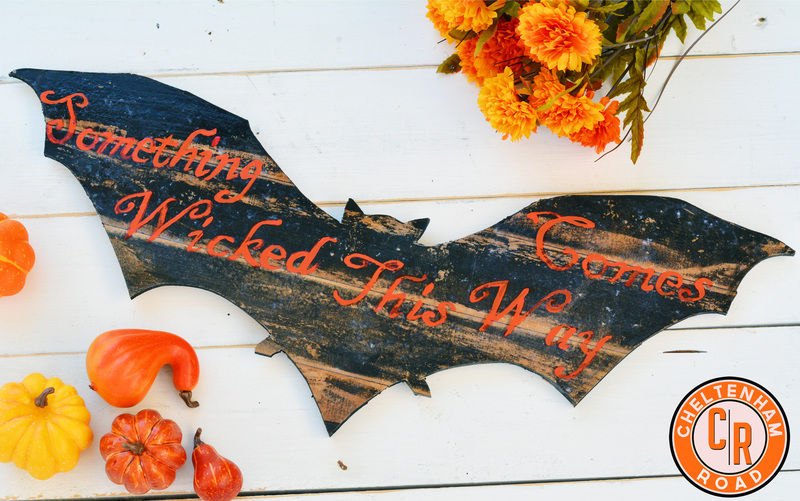 Maybe you could base coat the bat first with orange…use something as a resist for the lettering part, then wash off after you coat with black? I like the bat but agree the letting is wonky with the last word above the others…just my two cents. I still think you are hilarious and your posts crack me up. You are also talented and creative. thanks Lorrie. I think I will try it again and incorporate some of the suggestions I’ve gotten. Man I love this little community of creative people! Please, please, please go back to black type. The gray is much harder to read. Have pity on my aging eyes. This is one of my biggest gripes with many websites–that gray type is apparently considered more stylish. Hi. It is black type (I don’t seem to have control over color) -just a thinner font. I’ve tried (9.9) a different font that I’m hopeful is more bold and makes it easier to read. Thanks very much for the feedback I truly appreciate it. I’m still trying to fix up the site so please do chime in as we go through various iterations.